I know it’s not smart to buy a wine based on the picture on the label, but you must admit, the label on this one is just so pretty I couldn’t resist. It’s also Primitivo, something else I find hard to resist. The American translation is Zinfandel, the variety brought over from Italy by early settlers, but this is the real deal, from the heel of Italy, in this case farmed organically, old-style. 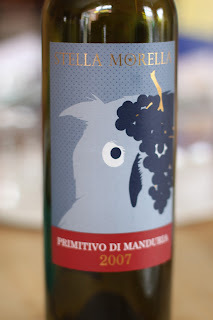 Stella Morella Primitivo di Manduria is a rich deep purple with good legs, it smells of squished blackberries and loganberries with a hint of festive spice. It feels soft and warm with just a smidge of firm tannins, at the upper end of medium alcohol level. The fruit has a scrummy fruit crumble cookedness to it, rather than jamminess. It’s ready to drink now, I don’t think there’s much room for it to get better. It was £15 from Berry Bros & Rudd, not a cheapo bottle, but a worthwhile treat for the Easter weekend. Would You Prevent The Kennedy Assassinaton?